So getting involved with the first couple chapters I’m finding nothing new – in fact some of the language is a bit dated (“soulfulness”) and in places it reads like a self-help book. I think the gist of it is the author’s interpretation of the New Testament and taking it out of the realm of the material, putting more emphasis on the spiritual or the “tao” of it. I read my first Zen books back in my 20s – I went through a period of devouring self-help books from Psycho-Cybrenetics to The Care of the Soul and The Search for Serenity. A bit later I read a lot of straight Christian classics from C.S. Lewis to the Renovare Classic collection and books associated with those – powerful stuff. Leong’s book is not in the same category but I’m learning a few things – Of course I suppose it shouldn’t really be “new,” more like “refresher” on the ideas of “chop wood, carry water,” mindfulness, acceptance, etc. And I’m quite familiar with the Bible (thank you). It feels like Leong is really stretching sometimes – he really wants to fit the teachings of Jesus, particularly his own cherry-picked ones, into the ideas of Zen Buddhism or the Tao. Part of the problem, for me anyway, is his logical and well organized point – definition, point-definition, point-definition method. Very non-Zen. But parts are interesting. I enjoyed the sections on gentleness. I suppose I’m skimming this one to an extent because of my background, but every couple pages I come to a “point” which stirs interest – possibly a new way of looking at something. But too often I feel like I’ve read this before, the thinking, the sources and the quotes (other than the Bible and classic thinkers) are frequently from the 1970s and ’80s. I mean, M. Scott Peck? 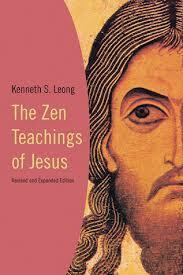 But neither was Jesus a Zen master – he was Jewish carpenter from Nazareth during the Roman occupation. I tend to view him as a prophet. I think Leong tries too hard to reconcile these ideas – it’s not necessary.